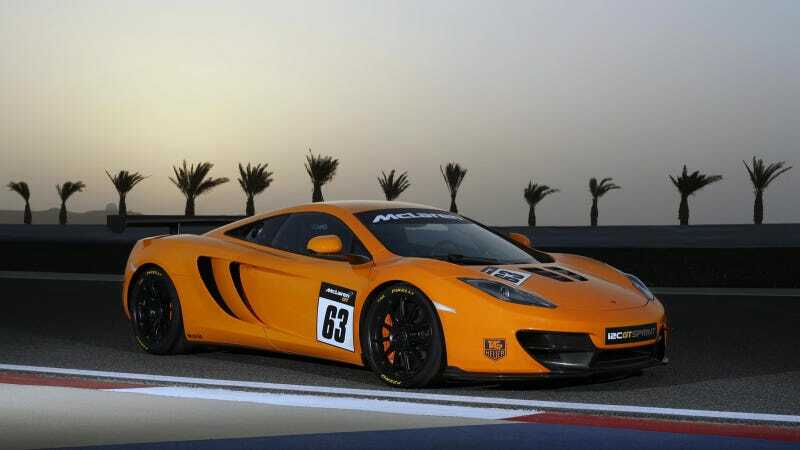 If you thought the McLaren MP4 wasn't focused on performance enough, McLaren's GT group has spilled more details about the made-for-the-track version of the supercar, the 12C GT Sprint. Originally shown at the Goodwood Festival of Speed, the Sprint keeps the standard 3.8-liter 616-horse V8 and dual-clutch 'box as the standard car, but the McLaren Group's GT squad has taken out "any unnecessary systems or creature comforts have been removed to keep weight to a minimum." But it does keep its A/C system, so you won't roast on a hot day. A 40mm-lower ride height, racing seats with six-point harnesses, race-spec tires and brakes and, of course, a fire extinguisher, are also part of the package. McLaren would really like you to order it in orange, but twist their arm and they'll paint it in any color. It can be yours for the equivalent of about $315,000 at your local McLaren dealer. Check out the full release for more pictures and info on the 12C GT Sprint.